REDWOOD CITY, CA--(Marketwired - March 30, 2016) - iCracked.com, the largest and most trusted provider of smartphone repair, has entered the enterprise space by launching iCracked for Business. The new service is intended to solve a $1.5B mobile device management (MDM) problem for organizations across the U.S.
As an extension of the company's core services, iCracked for Business supports organizations in need of efficient and cost-effective repair for fleets of mobile devices and tablets. 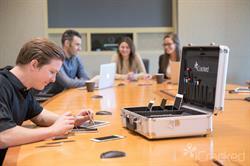 With on-demand, on-site repair service at the click of a button, iCracked for Business is the easiest and most professional way to fix devices, whether repairing employee devices at the client's headquarters, point of sale tablets at retail locations, or sales representatives' smartphones in the field. "While growing our consumer business, we discovered a massively underserved sector of the repair market. We understand that smart devices are critical to performance at all levels of the organization. iCracked for Business ensures that corporate devices are in top condition to enable the highest levels of productivity. In our hyper-connected mobile workforces, this is essential," said iCracked co-founder and CEO AJ Forsythe. The company powers a network of 5,000 on-demand repair professionals, known as iTechs, in more than 600 cities across the U.S., and throughout the UK and Germany. Every iTech in the global network is extensively background-checked and has completed rigorous certification programs. For iCracked for Business clients, the most tenured and highest customer-rated technicians are deployed. According to a study by the IDC, mobile workforces are expected to top 105 million by 2020, growing from 96.2 million in 2015. By this account, mobile workers will account for 72.3 percent of the total U.S. workforce. * Key drivers behind the growth in the U.S. mobile worker population include the increasing affordability of smartphones and tablets, larger acceptance of corporate 'bring your own device' (BYOD) programs, entrance of the Internet of Things (IOT) into the BYOD realm**, all presenting unique challenges for the care and protection of corporate devices. "What we are seeing in the enterprise space is a need for fast, reliable repair wherever the client is located. iCracked's network covers 95% of the U.S. population, making it possible to quickly repair devices without disruption to the business. We see a huge pain point for IT professionals in finding a solution that is not only professional and convenient, but can support unique infrastructures, volumes and logistics, and iCracked for Business is that solution," said Neil Harrington, VP of Sales at iCracked. Made possible by the nationwide repair network, the company offers unique solutions for each organization based on specific device management needs, from one device to 10,000 devices. Offering same-day service, repairs are managed through dedicated appointment schedulers for seamless booking through the new enterprise team. "iCracked has been a reliable partner for us. The team is extremely responsive to our needs. We look to iCracked to keep our business operating smoothly, and our field technicians focused on delivering quality work," said Aaron Finlay, co-founder of Boomtown. A highly distributed mobile workforce, evolving BYOD practices and devices and growing data protection concerns all present problems in caring for these essential pieces of technology efficiently and cost-effectively, for which iCracked for Business has the scale, distribution, security and mobility to solve. To learn more about how iCracked for Business can improve your organization, visit iCracked.com/enterprise. **Scott Matteson. January 2016. TechRepublic.10 Ways BYOD Will Evolve in 2016.
iCracked is the world's largest and most efficient on-demand repair, trade-in and protection service for smartphones and tablets. Powered by a network of 5,000 certified iTechs located in 600+ cities across the country and abroad, these local professionals are dispatched at the click of a button to respond to on-demand and on-site repair requests for both consumers and businesses. Through iCracked Advantage, the industry's most affordable protection plan, users also have the security and assurance that their devices are always covered. The company is headquartered in Silicon Valley, with presences in London, Berlin and Tokyo. To learn more, visit www.iCracked.com.